The most common symptom is pain deep in the joint with rotational movements. Diagnosis is made based on the symptoms and physical examination. A regular MRI scan may not show up a SLAP tear and therefore an MRI with a contrast dye injected into the shoulder is ordered. This is called a MR arthrogram. Dr. Patel may recommend anti- inflammatory medications to control pain along with physical therapy to strengthen the dynamic stabilizers of the shoulder. In athletes who want to continue their sports, arthroscopic surgery of the shoulder may be recommended. Depending on the severity of the lesion, SLAP lesions may simply require debridement or some may need to be repaired. In a majority of cases, the biceps anchor is involved and the biceps has to be addressed to resolve the pain. 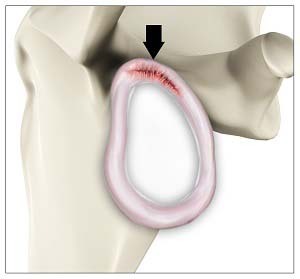 A SLAP repair can be done using arthroscopic techniques that require only two or three small incisions.